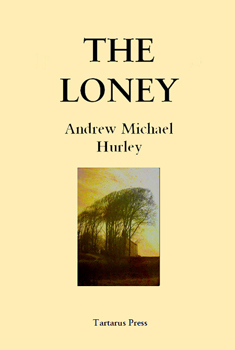 The Loney is Andrew Michael Hurley’s first novel, after two collections of short stories (The Unusual Death of Julie Christie and Cages And Other Stories). As usual for Tartarus Press, the book is sumptuously presented, the oblique miniature on the dustjacket disclosing little about the novel’s contents but nonetheless setting the tone at just the right pitch from the outset: a haunting, blurred landscape sliced through by a menacing swathe of trees; in the background stands the shadow of an old house; this glimpse no more than a far-off echo of the titular stretch of brooding coastline which although unspoken is one of the novel’s main protagonists. On the surface, the book is the story of the narrator Smith (does he have a first name? Smith seems such an everyman surname…) and his mentally disabled brother Andrew, or Hanny as Smith calls him. They gather with family and acquaintances for a pilgrimage to a noted Catholic shrine in a remote coastal area of Lancashire, ostensibly seeking a miracle ‘cure’ for Hanny. It is the story of a transformation, of transfiguration and of the place faith has in the boys’ lives and the lives of the others around them. Resolution of a sort does come, but the genesis of the miracle is uncertain and what will come later, after we read the final pages of the book, is terrifyingly unclear. The book also struck me as being about loneliness and isolation. The Loney: shades of alone and lonely, though the word might at first seem a playful, even childish name for a stretch of countryside. It’s obvious as the book progresses that the Loney is unwelcoming and unforgiving. Hurley handles the effect of the landscape well and his narrative is allowed to unfurl at a pace which is perfectly suited to the story’s various minor and major revelations and which never feels hurried. The Loney as a place is ominously present throughout, even if not everything in the story occurs there. There is a highly convincing, pervasive atmosphere of uncomfortable dampness and otherness; a half-remembered feeling of the 1970s before the advent of a technology that no longer allows anywhere to be forgotten or abandoned. Aside from the painterly skill with which he depicts the growing sense of unease and unreality in that forgotten landscape, it’s also noteworthy how the author reproduces the dialogue in the novel. The interaction of the dysfunctional main characters, all tied together by their devout Roman Catholicism and a strict over-reliance on its rituals and structure in the wake of the death of their former parish priest, is masterful. These people have little else in common but their faith, or what they perceive as faith; without it, everything else is lost and relationships crumble. The scenes where the characters converse, particularly the narrator and Father Bernard, are remarkably credible and fluid. I was there with them, eavesdropping, uncomfortable and uncertain; and also afraid. What is also critical in the protagonists’ lives and in the story proper is the part played by faith, even if it’s obvious by the end that faith can take many forms, not all of them a matter of personal choice. I suspect that Hurley was brought up with Roman Catholicism: the detail of this in the novel is so authentic and convincing that I’d be surprised it he hadn’t been. Having had a similar upbringing, I found the novel all the more realistic for the verisimilitude of religious detail – and, by its end, that authenticity makes things quite horrific. Father Bernard calls Smith by the nickname Tonto, no doubt after the Native American partner of the Lone Ranger (there’s that word lone again); that same Tonto who fondly calls the Lone Ranger kemosabe (‘faithful friend’). But Smith’s faith is uncertain, never clarified and by the end, even he is not sure what he believes, or if faith has transmogrified into fear. When I think back on reading The Loney, I realise that, consciously or unconsciously, it is a book of dualities. Two very different houses, Moorings and Thessaly, separated by a dangerous stretch of coastline only passable at certain tides, and unpredictably so it seems. Separated, too, by their outlooks: on the surface, both faded, unwelcoming and alien, but the surprise comes with the revelation of which house breeds the stronger faith and which is filled with sickness. Then there are the two boys, Smith and Hanny, opposites in some ways but who have a communication only they truly understand. There are the two priests, Father Wilfred, recently passed away, and Father Bernard, different aspects of Catholicism, the old and the new. And finally there is the competition of creeds which becomes the central brooding duality of the book. Comparisons have been drawn between Hurley’s novel and The Wicker Man. I can see why that is, but I think it’s also slightly misleading. To me, the horror of The Wicker Man has always been that sense of finality and utter hopelessness in its denouement. It’s shockingly, brutally clear what befalls Howie in the climax to the film: we watch, horrified, in no doubt as to his fate, at least on Earth if not in the hereafter. With The Loney, things are a little different and left more vague; it’s a gnawing, questioning vagueness that one gets in the most oblique supernatural fiction. I’m still not certain, after quite a bit of reflection, what exactly happens in the concluding sections of this book and in my view that is a major triumph of the story. It’s the hidden spaces and the places in between that haunt this story, and raise doubts about what did happen to Hanny–and to the narrator–and what is to come after the last words of the novel end and only the blank page is left. What I loved about The Loney is that it struck me as the kind of book Robert Aickman might have written if his strange stories had expanded into strange novels. Yes, it’s more narratively linear and “filled out” than Aickman’s work, and possibly Hurley’s portrayal of the novel’s human characters as distinct from the landscape is less contemptuous and alien than some of Aickman’s. There is, however, a real question at the end of this book as to what the horror actually was, or remains, and what we are meant to take from it. And that strikes me as remarkably Aickmanesque in tone, and therefore as a very good thing indeed. The Loney is highly recommended for those who like articulate, striking supernatural writing that challenges after the fact and lingers in the memory. It’s one of the most convincing pieces of modern weird fiction I’ve read in a long time. The book is available from Tartarus Press in both hardback and ebook formats. There is also a lovely book trailer and interview with the author on YouTube here, put together by the good folks at Tartarus. Sounds a really compelling read and an interesting new project Brian.